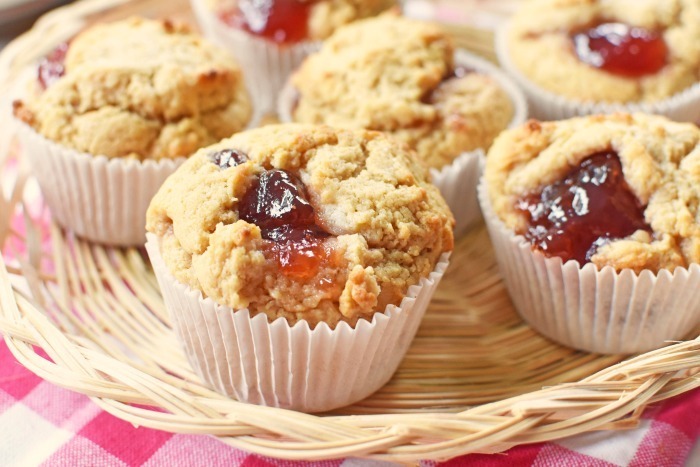 Peanut Butter and Jam Muffins (Moist and Exploding with Flavor)! 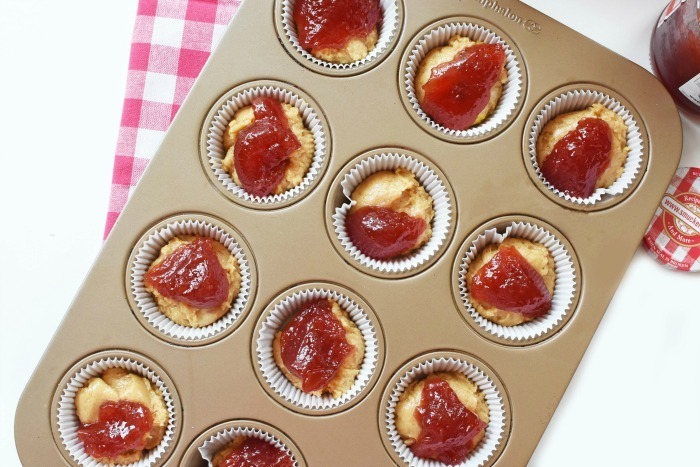 Home » Recipes » Dessert Recipes and Ideas » Peanut Butter & Jam Muffins! 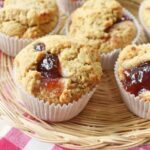 Peanut Butter & Jam Muffins – An Amazingly Delicious Recipe! Peanut butter and jelly- or jam, in this case, is something that I grew up on. I used to get school lunch pretty much every day in middle school and would always opt for the alternative lunch. This was either peanut butter and marshmallow or peanut butter and jam/jelly. It might have seemed like a simple kind of lunch but my coffee milk and sandwich were something I looked forward to each day. 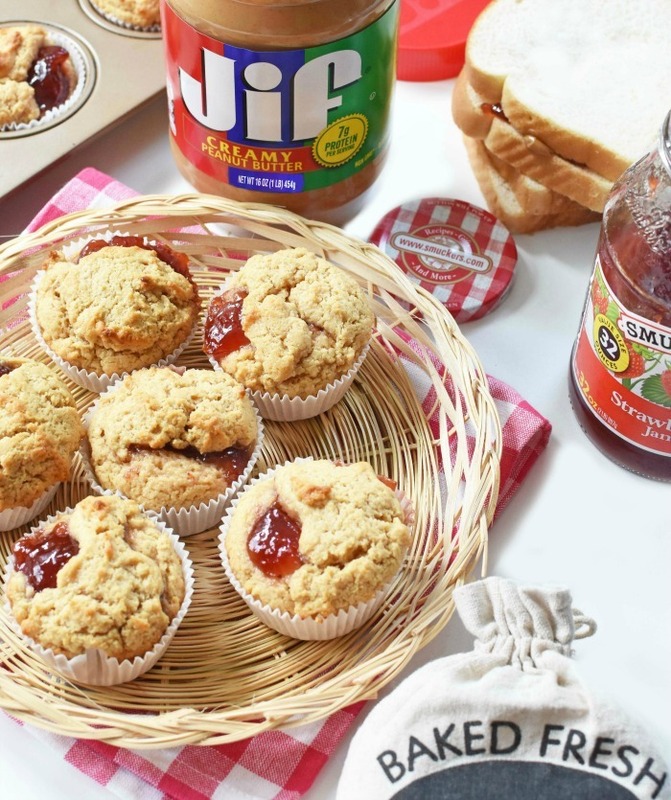 My mom was not a baker and surely didn’t create yummy baked treats like these Peanut Butter & Jam Muffins inspired by Smucker’s®. When my kids head back to school they will each be getting their choice of Jif® Peanut Butter, and Smucker’s® Jam. 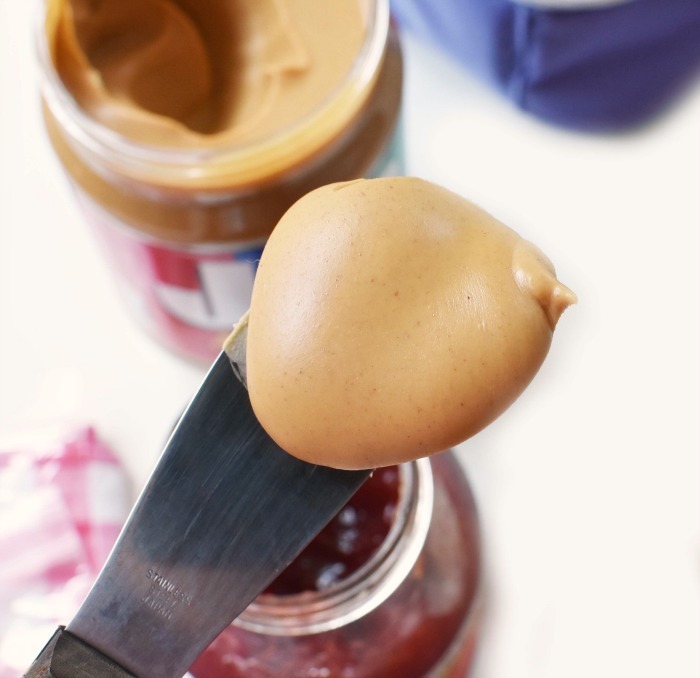 Today, we are featuring the classic Jif® Creamy Peanut Butter and Smucker’s® Strawberry Jam. These classic flavors are two I grew to love over the years. Now, my 3 kids also love them although one of my kids might be crunchy peanut butter kinda girl. 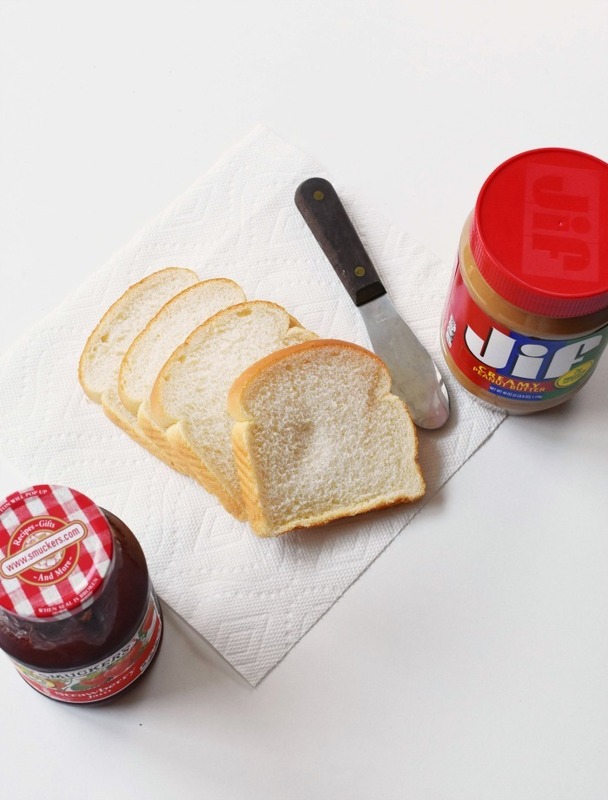 Making a peanut butter and jam sandwich is a rite of passage for kids independence. I know it was the first lunch I ever created independently because it is just so easy. 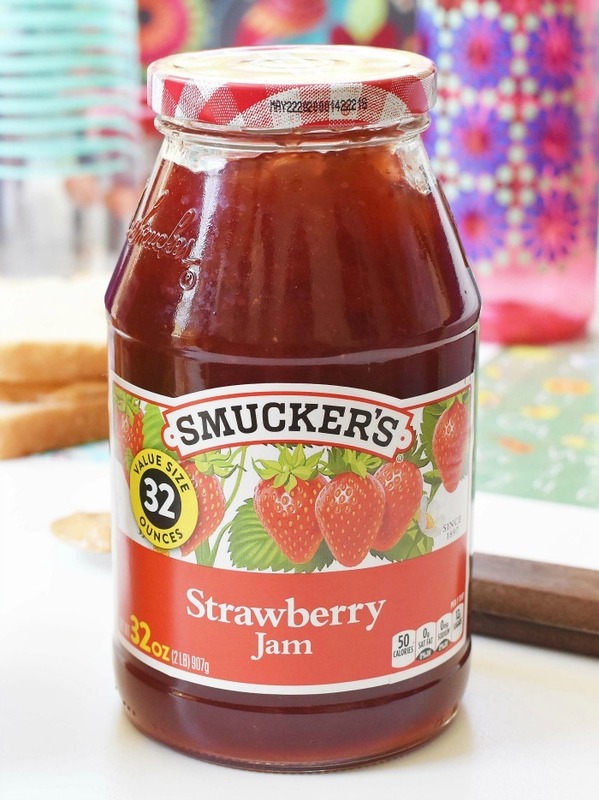 We always have a few extra jars of Jif and Smucker’s products in the pantry but never hesitate to stock up when there is a good sale going on. We recently picked some up at Dollar General. It was on sale and we were able to save more with an exclusive store coupon. 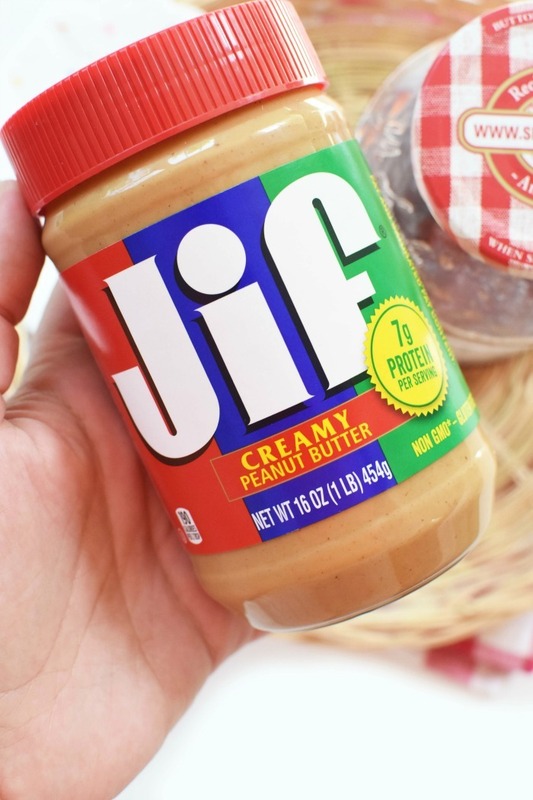 Save $1.00 off when you buy both Jif Peanut Butter & Smucker’s Fruit Spread at Dollar General using this coupon. Now that we have lots of PB&J in our pantry as well as plenty of drinks and snacks, we are ready for the first week of school. Summer vacation flew by this year, but I am so ready for routines and peaceful days! Speaking of snacks, my kids adore Jif Peanut Butter and Smucker’s Jam. 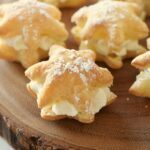 As a special treat, I decided to try out this recipe I found on the Smucker’s site. 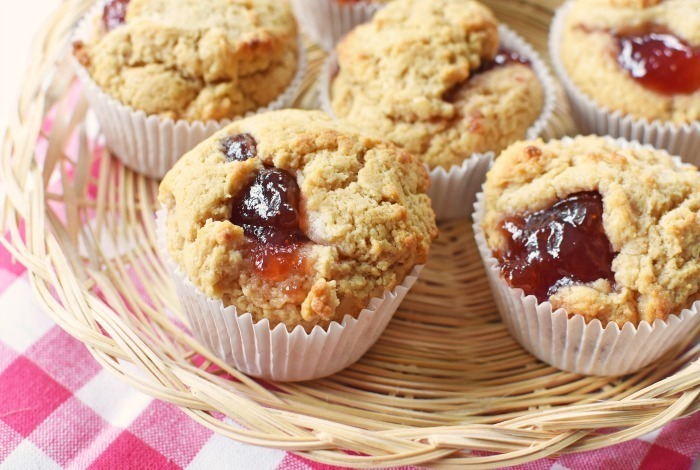 These Peanut Butter & Jam Muffins are amazingly delicious and are so quick to make. I have never tried a combo muffin like these before and admit to sneaking just a teeny taste. They were so good! 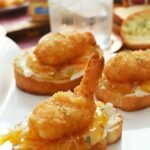 Perfect for a back to school breakfast or snack option to accompany a peanut butter and jam sandwich. 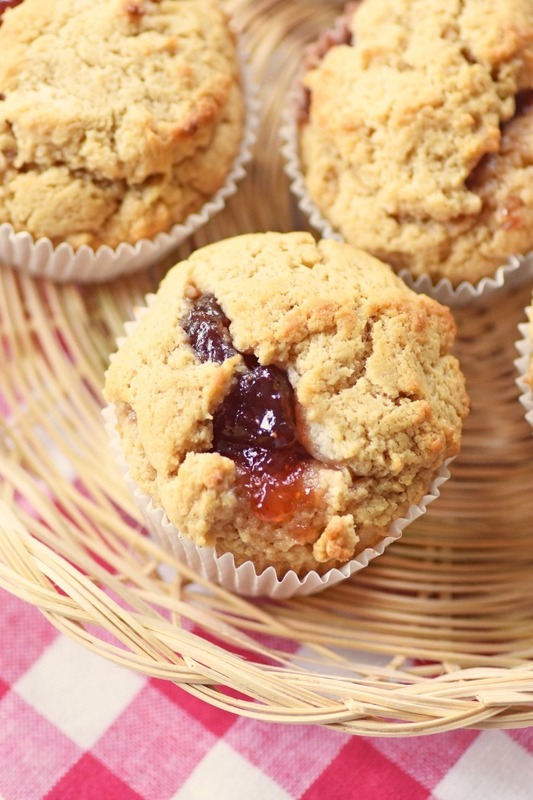 Get the printable recipe below for these Peanut Butter & Jam Muffins. You can also just make Peanut Butter Muffins if you omit the jam- I made a batch of each! 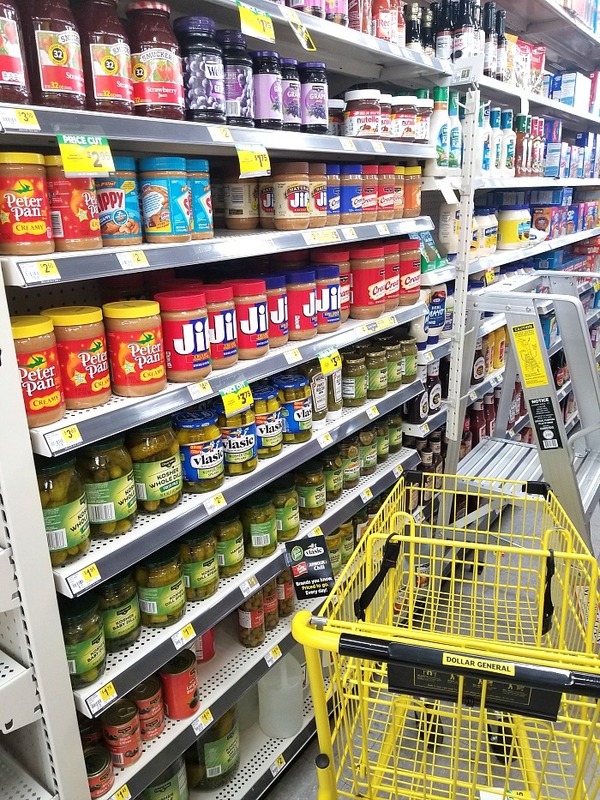 Will you be stocking up on Jif and Smucker’s at Dollar General? 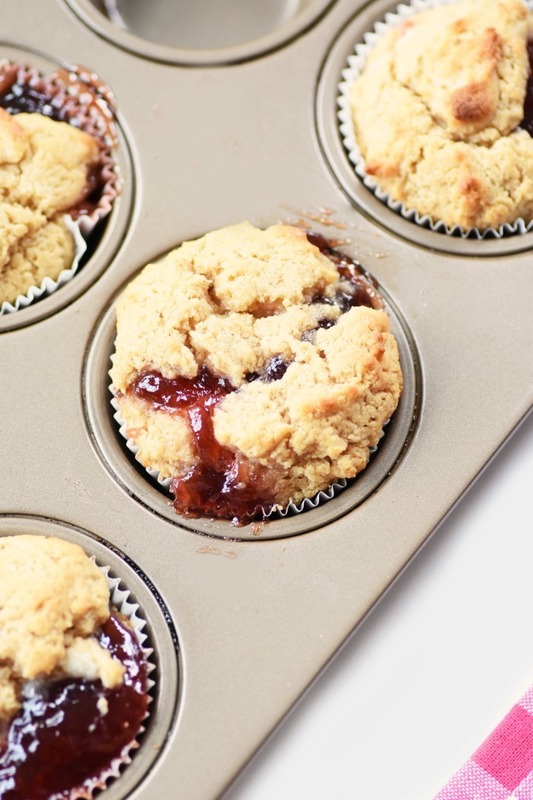 Maybe you want to try these PB&J muffins? 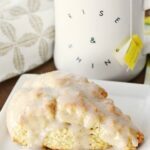 A delicious muffin recipe that is ideal for breakfast or a snack! Spray your muffins tin(s) with non stick spray. This is helpful because the jam can overflow while baking. Add in your milk, eggs, oil, and peanut butter. Combine until well-mixed. Using a small ice cream scoop sprayed with non-stick, add a small layer of batter to each cupcake liner. Add a dollop of jam to each. Add an additional small layer of batter to the bottom. Bake for 17-18 minutes or until a toothpick inserted into the muffin comes out clean . This is the grown-up version of everything I ever loved as a kid! This is the best muffin recipe ever! This is such a fun muffin idea. I feel like they would make such good after school snacks for kids. I love those flavors! Oh I am all in for these. They sound delicious! You won’t believe it, but I made some peanut butter & jelly muffins last weekend! They actually FAILED horribly. 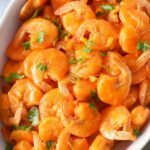 I needed a new recipe, and here you are! Thank you! These muffins look like they would be so good. My kids would eat these up! I love this! These muffins would make great Back to School morning breakfasts. What a delicious idea! 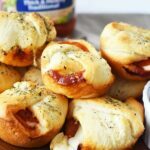 My son is all about the peanut butter and jelly and these would be perfect for back to school mornings! My favorite PB&J supplies! I need to make these muffins, they are perfect for after school snacks! 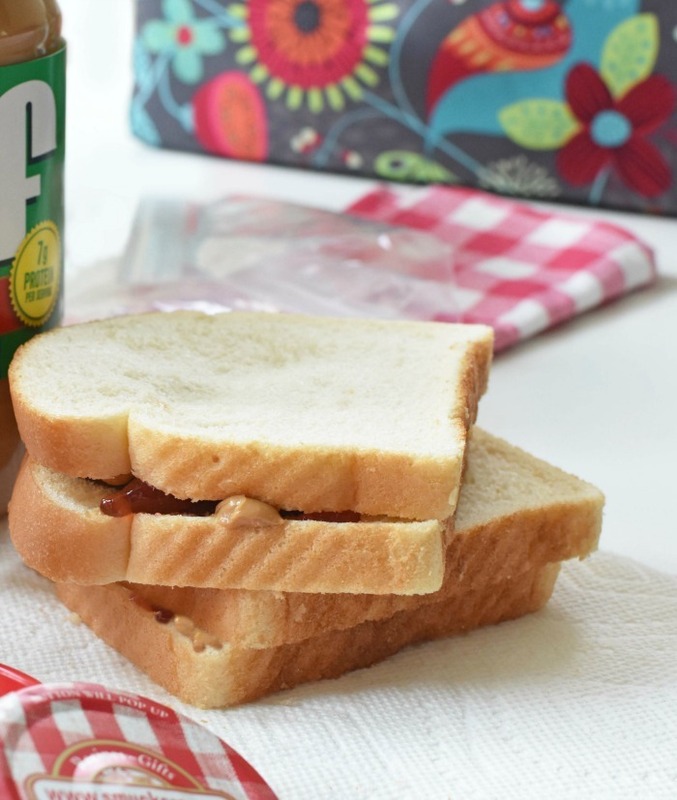 There is nothing like the classic combo of peanut butter and jelly. This sounds like a great muffin recipe. JIF and Smuckers are my go-to for anything PB&J. Although I’m more of a traditional grape jam guy. 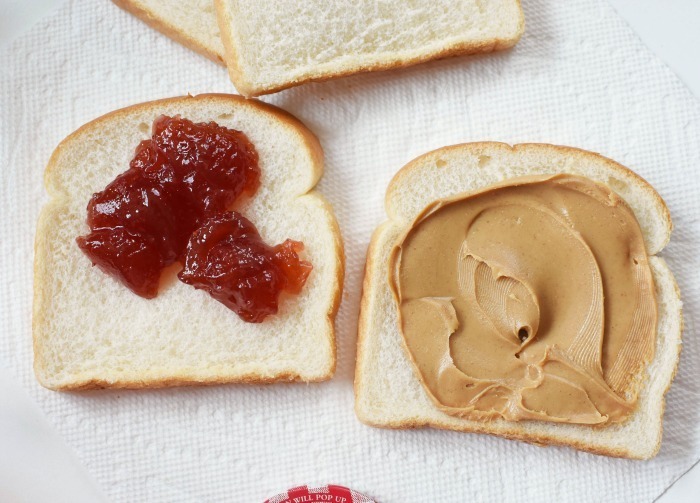 This is such a great way to upgrade a peanut butter and jelly sandwich. My son would definitely have loved these muffins for lunch when he was in school. I would have never thought to make muffins like this. I think this would be interesting. I bet they taste amazing though. I’ll have to give them a try. Anything with peanut butter and jelly is yummy! These muffins sound AHHH-MAZING! Can’t wait to try them. I would love to bake up a bunch of these to have on hand for school lunches. Thanks for the recipe. You probably can!! I often do make the swap! !